Barcelona is a city that endlessly enchants. From its fairy tale architecture to its hidden city squares, it’s hard not to fall under the city’s spell. It’s an ideal city to wander around and get lost in the tree-lined streets and the vibrant local markets. If you only have a day and a half in this seaside city, the trick is to plan well and you can see quite a lot. Here’s some activities that will allow you to make the most of your 36 hours in Barcelona. Barcelona is ideal in the spring or autumn, when there are less crowds and the weather is bearable. It’s no joke that the city doubles in size with tourists during the summer and it’s so much easier to walk around when you don’t feel like you are fighting the crowds in triple digit heat. Plus the prices during the shoulder seasons are also more reasonable. The city’s metro is convenient and is great transportation option to get to most of the popular sights. The extensive bus system is also a great alternative to go to spots like Park Guell, that don’t have a direct metro stop. For ride share choices, there is Uber and a local company, Cabify, as well as traditional taxis. Aerobus is a convenient airport shuttle that drops passengers off at popular points throughout the city. If you have more patience, the metro goes all the way to the airport as well. Start your day at Gaudi’s most famous masterpiece in the city, which is truly a must if this is your first time to the Barcelona. This unfinished church is expected to be completed in 2026 and you can witness the old portions of the church (construction started in 1882) that blend effortlessly with the new additions. It’s worth it to pay a bit extra and go up to the towers which boast panoramic views of the city. There are also guided tour options available. Travel tip: buy tickets online, to avoid waiting in long lines. 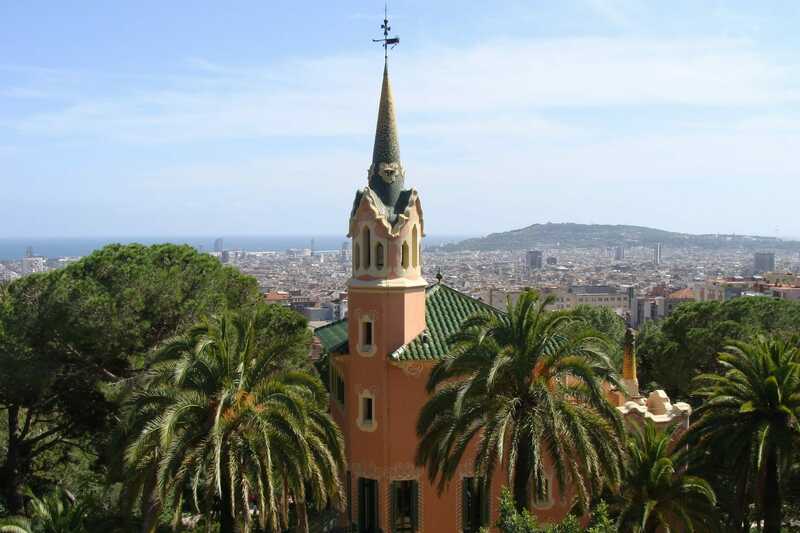 Another one of Gaudi’s must sees that boast impressive city views and a spacious park filled with whimsical structures. The popular buildings (including the pink house where Gaudi lived for awhile) requires a ticket and are best to buy in advance in case they sell out. Without a ticket there are plenty of the grounds that are free of charge and worth seeing as well. It’s easy to spend at least a few hours, wandering around the non-ticketed areas, listening to music and climbing up the hillside to take in the panoramic views. A quiet neighborhood that seems miles away from the noise of Parc Guell, but is actually right next door. This neighborhood was actually its own independent town until the late 1800s and with minimal traffic it still feels like a separate world away from the bustle of the city. Gracia is a great place to get lost in for a few hours, explore the spacious city squares and narrow side streets, including the lively street of Carrer Verdi with its unique shops. One of my favorite things to do is sit in Placa de la Virreina and witness daily life unfolding from parents walking their children from school to dog owners going on their evening stroll. For the evening, head to this neighborhood that is known for its Gothic architecture. Most of the streets are closed to vehicles, making it a great place to wander around on foot. Stop at Placa de Sant Jaume the administrative center of Old City Barcelona, where the City Hall and Palau de la Generalita are right across from one another in this historical city square. Cathedral of Barcelona is a Gothic cathedral from the 13th century, that is especially magical when it’s lit up at night. Placa Reial is a popular bustling square, that comes to life at night with cafes, restaurants, and bars lining the perimeter. This square is hidden right off of Carrer de Ferran, right before entering La Rambla. This is the city’s most popular market, where you can find anything from fresh produce to tapas bars. It’s a great place to start your day with freshly squeezed fruit juice and a treat from one of their bakeries. The prices are marked up for tourists, but it’s still worth experiencing the dizzying variety of food and the lively atmosphere. The market is located on the busy Las Ramblas thoroughfare, which is known unfortunately for its abundance of pickpockets, so be aware of your belongings at all times. This is another of Gaudi’s masterpieces worth checking out on the main throughfare of Passeig de Gràcia, even if you view it only from the outside. If you have a moment to go inside, make sure to purchase the tickets ahead of time, to avoid waiting in line. A mere 7-minute walk away is Gaudi’s Casa Mila (La Pedrera), which was the last private residence that the architect built and is still used as office space/apartments today. If you want to tour inside, make sure to get your tickets in advance. Wander the labyrinth of narrow alleys of this artsy neighborhood, and discover lively bars, restaurants and boutiques. This neighborhood is located next to the Gothic Quarter, and nearby Las Ramblas, but is noticeably less crowded. Highlights in this neighborhood include the ever-popular Museu Picasso, Santa Caterina Market, and the Gothic cathedral La Santa Maria del Mar. Head over to this beautiful man-made beach, where you can walk along the water, swim in the clear sea or soak in some of that warm Spanish sun. There are plenty of seafood restaurants, cafes, and gelato shops along the waterfront for fuel after a day at the beach. Head to nearby Port Olimpic, the sight of the 1992 Olympics in Barcelona, that is now a modern port area that offers restaurants, shopping, and beautiful marina views. Visit the stunning Fira de Barcelona built in 1929 for the World Expo, this trade fair institution hosts trade shows and exhibitions, and has a beautiful exterior with great views of the Placa d’Espanya below. The nearby Las Arenas de Barcelona is a commercial shopping center with a spectacular 360 rooftop view of the city, where you can take an elevator from the street straight up to the top. Determined to try a classic Spanish bocadillo? Splurge and pay a few more euros for the jamón bellota (a fancy version of jamón iberico), that literally melts in your mouth. Also while you’re in the shop check out the dizzying array of ham options. There are a few branches around the city. Known for their delicious focaccia bread, they also serve healthy pastas, salads and desserts. My personal favorite is the lox and crème fresh focaccia bread and I will shamelessly admit I had it twice in the same day. Offers a nice counterbalance to all that Spanish ham. Great value. Several branches around the city. I didn’t have chance to go this time round, but I’ve only heard good things from friends about their informative and delicious Barcelona food tours. Also, check out Jodi of Legal Nomads and her recommendations of where to eat in Barcelona, catered for those who are gluten-free. This central hostel has spacious, clean rooms, friendly staff, and lovely common areas including a large balcony where you can eat a complementary breakfast with a scenic view of the courtyard below. There are nightly low-key social events like paella night, and best of all quiet hour is enforced. Double en suites are available. A few minutes walk to the metro station. Located right on the Placa d’Espanya, this modern hotel is a great choice if you want to stay in a very central location, including close by to numerous restaurants and the historic Montjuïc, an ancient army fortress that includes a castle and stunning views of the city. Steps away from the metro station and close by the airport. This beautiful boutique hotel is situated in the Gothic Quarter, and is walking distance to the beach, Las Ramblas, and the El Born neighborhood. Highlights include a rooftop terrace with a bar, a plunge pool and a view of the harbor. On the ground floor there’s a restaurant that offers a breakfast buffet. What is your favorite way to spend 36 hours in Barcelona?